I'm starting to work on a game idea i had for a while, but alas, the image of the game in my mind is so fuzzy i don't even know where to start. The basic gist is a Utopian/Dystopian near future cyber punk world, think bladerunner. Rocked out urban zones, industrial areas, megacon buildings, you get the idea. The Genre is a platformer with beat'em up and shooty elements. The idea would be to have fun moving around in bigger areas, running across roofs of warehouses, grapple hook onto flying cars or monorails, and have a more methodic approach in indoor areas. Not necessarily stealthy, but i'm thinking across the lines of the blackthorne covering system, but with more options (back attacks, generally melee, who knows). So the main character was supposed to be a gruff detective type character, but then i remembered i have this character i created for a cyberpunk game jam, so i'm reusing and redesigning this right now. Turns out character design is not my strong suit, among other things. She has protheses for her lower legs, initially thought of as spring/coil type things, but i'm having trouble getting a detailed version going without it looking odd/wrong. I looked up some references on this, but they are mostly C shaped springs that just dont-look-as-cool so i'm trying out a couple different designs, also influenced by this (by Adrian Dadich). So far the design is all over the place, and it's hard to make a decision. Gruff looking character vs metroid zero suit kind of design. I think i'd rather go with a gruff, dirty, dystopian design but i have a hard time to figure out design elements for that. Would love to know some references for this, as my repertoir for that is pretty slim (movie, anime, anything). The other trouble i have is the environment perspective. i like the slanted sideview, and that it creates more depth. What i dont like is the mixed perspective (outer walls) it just projects weirdly. having the perspective fixed would work (i.e. the right outer wall is flipped) except if there is a wall in front of that house (i.e. you're outside of it) you would not see the window and therefore break into it. 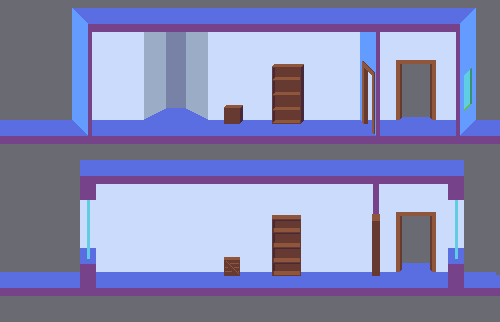 The flat view is more consistent, but it fails to represent depth as nicely and its hard to make out the door frames and windows. 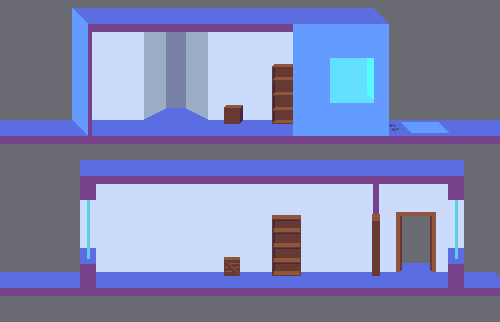 I'm kind of torn between things and i'll probably have to look up more refs of games that project as either, although most platformers i know dont even bother with depth at all (being a flat 90degrees orthographic view). A lot of games have obviously faced this problem. The workaround to showing windows on the other side of walls is to give visual clues whenever one is there. Here I've done a few things. Firstly I put some light on the floor to the right of the window to show that there is a window here emitting light. Assuming it's night or something. Then I added some nice creepy footprints by the window to imply people stand there to stalk the occupants or see what's to steal or something, but it could be anything. Broken glass, broken pottery - something to give the player a hint that there is a window here. There's also things like making a path going to the window (assuming you have a different colour you use to denote paths where the player can go). Finally I added a window on the front facing wall that reveals there is a window on the wall you can't see. You could also just put more light on the inner wall of the house to show light is being let into the room through a source on the right of the house. So if you're not careful it's just going to look like she has boots on. You can remedy this by leaving open areas where part of a leg might normally be. I only noticed that some of your designs had done this once I changed the background colour, but I made an edit with more exaggerated gaps. I also made an edit with more mecha style legs. Hey ambi, thanks for your input. Good thoughts with the front window, and light projection on the ground outside. Also really love your leg designs. I tried the .. uhm.. lets call it double-jointed limb with some previous attempts, but its really hard to read. Exaggeration is something i have to learn as well. Mostly i feel like "ok if i do too much here it might be bad" and then in retrospect i was only at 4/10 on the exaggaration scale.